Inachis io, more commonly known as the Peacock, has a wingspan measuring 50 to 55 mm. 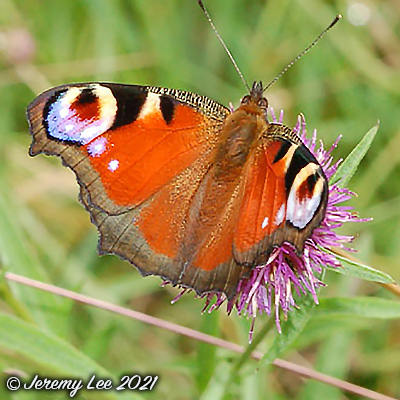 The Peacock is a familiar sight in gardens across the British Isles and is unmistakable, with quite spectacular eyes on the upperside of the hindwings that give this butterfly its name. The Peacock can be found in woods, fields, meadows, pastures, parks, and gardens, and from lowlands up to 2,500 metres (8,200 ft) elevation. It is a relatively common butterfly seen in many European parks and gardens. The Peacock male exhibits territorial behaviour, in many cases territories being selected en route of the females to oviposition sites. The adult butterflies drink nectar from a wide variety of flowering plants, including buddleia, willows, dandelions, wild marjoram, danewort, hemp agrimony, and clover; they also utilize tree sap and rotten fruit.